We finally made it through one of the coldest winters we have seen in quite a while. All of the beautiful snowfalls that we greatly anticipated, just brought tenths of inches or even worse, ice. One evening some of the most beautiful and largest snowflakes I have ever seen filled the darkness. The child in us all makes us stop and marvel at the quiet beauty that comes with snow. The stillness and peace falls over land along with the snow. That peaceful silence was suddenly interrupted with a bang. It sounded as if a door had been slammed, which alarmed us. We felt sure that we had an intruder. Once again, a loud bang. If this was an intruder, he needed another line of work, for he was a noisy one for sure. We checked all the doors, and listened to several more sounds which seemed to explode in all areas and continued through the night. The mystery was solved on the morning news. Ice Quakes? We had never heard them or heard of them until this winter. Water in the ground freezes and expands, the ice and ground around it crumble and create loud booms. Who Knew? 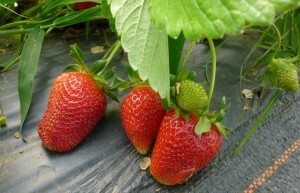 Strawberries grown in our Haygrove tunnels are earliest to season and make their way into the CSA this week. Today winter still wants to claim part of spring. The rain has the fields laden with water, so much so that no work can be done without doing more harm than good. Despite the cold, despite ice quakes, the signs of spring are all around us. The flowers are blooming, the smell of freshly cut grass is in the air, the trees are budding and the sound of tree frogs is filling the night air. However, the most important sign of spring is that the STRAWBERRIES are in! The sweet smell and flavor of the strawberry melts the ice quake memory, warms the soul with the promise of spring and delights our senses with the promise of more to come. Goodbye ice quakes, welcome strawberry spring! 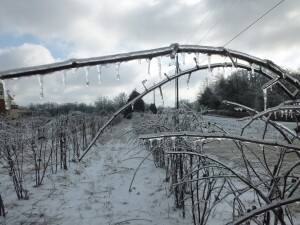 This entry was posted in CSA and tagged csa, ice quakes, spring share, strawberries on April 23, 2015 .